On the final days of the Caliphate in Syria, The Islamic State (IS) group wanted to use Mazin Saleem and his friends in their desperate scrabble for survival in Baghouz, the group’s last stronghold. Mazin was forced to put on an explosive vest and was being prepared for a move that never came to his mind. For Mazin and his fellow Ezidis who were kidnapped by IS from their hometown Shingal (Sinjar) in 2014, that cold day of February 2019 was a day full of fear and anxiety. Mazin confusedly looked at the explosive vests wrapped around their small bodies an being prepared to blow themselves up at Syrian Democratic Forces (SDF) fighters who were fighting IS backed by coalition forces. Mazin who is only 14, was trained by IS militants on how to use various weapons and suicide bombing since he was 10, after the group held him captive in Shingal’s Khanasur area. He spent more than 4 years under IS terror before he was finally taken with the militants to Baghouz. That day was as extraordinary as the overall situation was. Amid fear and intimidation, these youngsters were compelled to follow their superior’s commands. However, an idea occurred to Mazin. “The IS militants said today you are going to blew yourselves up. They mingled us with some women and children from Baghouz and sent us toward SDF fighters, but we carried our own plan and surrendered to SDF and threw the vests away”, says Mazin. 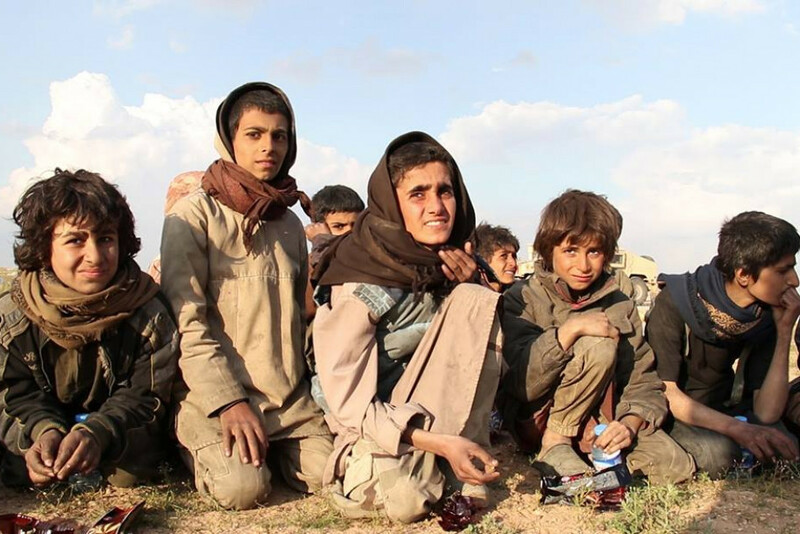 Mazin Saleem was only 10 when he was held captive along with his parents and his brother, after IS militants attacked Ninewa’s western town of Shingal and its surrounding areas on August 3, 2014. Mazin is from Bashuk village in Khanasur. He spent the first two months in IS prisons in Tal Banat and Kojo villages. “We were so scared. We didn’t know what they will do to us”, he said. Mazin’s mother was freed from IS captivity in October 2016 and now she lives with her son Mazin in an IDP camp. Mazin and dozens of other Ezidi children were trained on the use of heavy weapons while they were in Talafar, west of Mosul. They were also taught the Quran and were asked to convert to Islam. “We were trained for more than a year and a half on how to use machine guns, RPGs and other weapons. We also took special lessons on how to commit suicide bombings in a crowd. Anyone who refused to take part in the training was heavily beaten”, said Mazin. Last February, soon after he surrendered to SDF, the first thing which he wanted to know was about his hometown. “What happened to Shingla?”; this question of Mazin caught the attention of the media. “I was thinking of Shingal all the time; therefore when we escaped IS, the first question came to my mind was to ask about what might happened to Shingal. Shingal is as dear to me as my parents”, he said. When he was in captivity, Mazin’s was not allowed to speak in his mother tongue. He says, “IS fighters were spoke with us only in Arabic, they never let us speak in our mother tongue; therefore I need a few months to learn how to speak in Kurdish”, he told KirkukNow. Mazin endured appalling conditions under the IS Caliphate during more than 4 years in captivity. He suffered starvation, torture and excruciating training. He also says that the food given to them was dirty and that they had lentil and chickpeas soup on a daily basis with no tea on the menu. “The food was so dirty and unhealthy that we often got sick”, he said. On the day KirkukNow team had this interview; Mazin and some of his relatives were visiting Kanya Spee school in Duhok’s Kaparatu camp. “I am so glad for being here in this school. I want to join the other students and attend classes once again. Now all I wish is to be reunited with my father and brother”, said Mazin.